TVA employees entered the private property Tuesday, Jan. 22, 2019, in southern Meigs County where the federal utility wants to run a transmission line to serve a planned $300 million power control facility. Accompanied by an armed guard, TVA employees entered the private property Tuesday in southern Meigs County where the federal utility wants to run a transmission line to serve a planned $300 million power control facility. 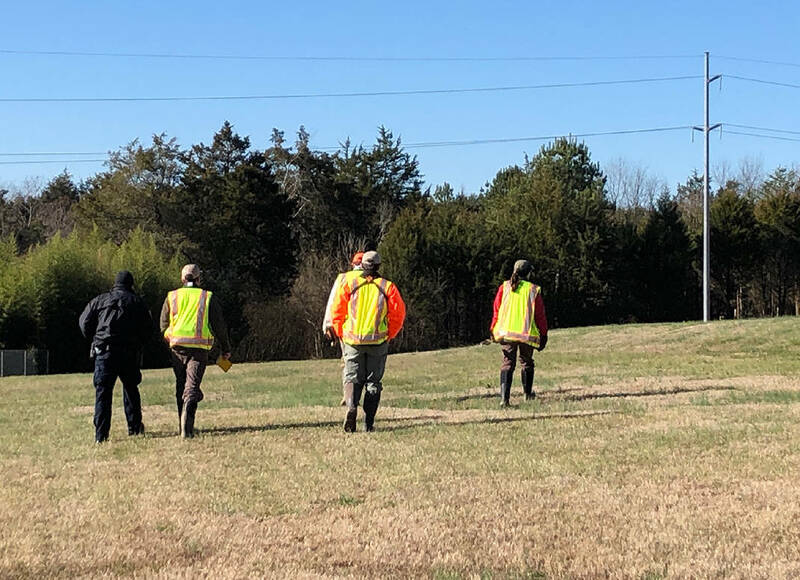 The four-person environmental study team from Knoxville spent a couple of hours walking along the existing TVA right of way before entering the private property to conduct tests to help assess four proposed routes by TVA for its project, which it billed as "Project Viper." Residents reported that the TVA employees were taking core samples along the route. "This was the third team that has been in Georgetown but the first to enter the land TVA is taking," said Greg Vital, one of four property owners currently in federal court, who talked with an employee who followed the TVA team. "The first two were TVA contractors, and they were friendly and engaging, willing to answer questions. "Then today, TVA employees show up and act secretive and arrogantly, just like TVA has been acting since this started last August," Vital said. "Once again, TVA shows that it would rather intimidate than build community relations in Georgetown." TVA said it is seeking an easement to extend a transmission line by about one mile over private property in the area. But TVA spokesman Scott Fiedler said the utility is not "taking the property" and is working in accordance with TVA's rights as a public utility to use eminent domain for easements for where the transmission lines would extend over the property. TVA wants to relocate its system operations center from downtown Chattanooga to a 167-acre site TVA bought in 2017 near Georgetown to provide a safer and more secure power grid. TVA conducted a public hearing on the project last August, but Vital said the utility should conduct another meeting to fully explain its plans. Vital and three other property owners sued TVA last year to block their use of eminent domain for the transmission line, but U.S. District Court Judge Harry "Sandy" Mattice rejected that challenge in a decision earlier this month. TVA archeological contractors are expected to enter the property Wednesday and look for Indian artifacts around Gunstocker Creek. Vital said TVA employees did not answer when they would return to the property to continue its environmental study, which is a process mandated by the National Environmental Protection Act. Vital previously said he will hire his own archeological contractors to assess the property because he does not trust TVA.